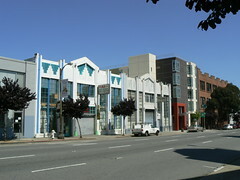 This is a pair of deco buildings dating from 1932 in San Francisco's Tenth Street. The nearer, number 255, has been painted to bring out the Art Deco details and while I have to admit it was the colours that confirmed that this was the next stop on my walk, I think I prefer Number 265, the unpainted twin next door. I often prefer the unadorned but in this case I like the highlighting. I think they've done a good job not overdoing the paint job.